LeBron James and Kyrie Irving delivered a masterclass effort in Game Three of the NBA Finals on Wednesday but it was still not enough to carry the Cleveland Cavaliers past the juggernaut that are the Golden State Warriors. 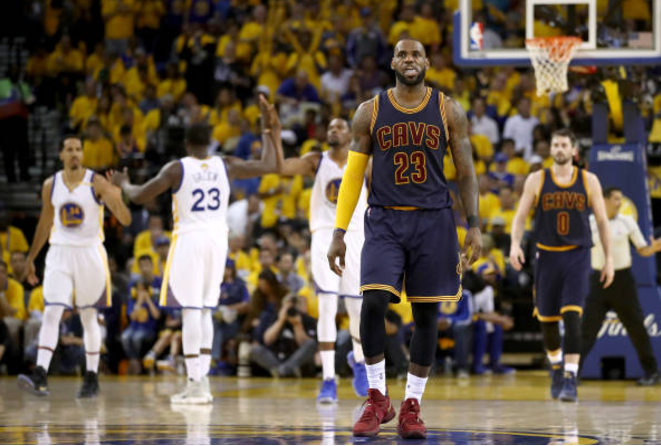 James and Irving combined for 77 points but their efforts went for naught as the late-game collapse by the defending champion Cavaliers left them trailing the best-of-seven NBA Finals 3-0. “I gave everything I had tonight,” James told reporters after the 118-113 loss. The top-seeded and undefeated Warriors, who can close out a perfect postseason run on Friday, boast a slew of weapons, most notably two-time reigning league MVP Stephen Curry and four-times scoring champion Kevin Durant. But the Warriors had other plans, especially Durant as he led his team on an incredible 11-0 run over the final three minutes, including a crushing three-pointer with 45 seconds to play that put his Golden State ahead for good. “He was their closer tonight, for sure. Doing what he is supposed to be doing,” said Irving. James has defied the odds before, perhaps most impressively last year against Golden State when his Cavaliers were the first team to win a title after trailing the Finals 3-1. But coming back from 3-0 deficit against an even more talented Warriors team than the one they needed seven games to beat last year is a different story. James knows his team have to play a perfect game on Friday or else they will be on the wrong end of a historic playoff run. “Even when you’re playing well, you got to play like A plus plus, because they’re going to make runs and they’re going to make shots and they got guys that’s going to make plays,” said James.